In a Nutshell: Few credit cards provide both low rates and rewards options. Typically, a card’s rewards are offset by a slightly higher APR that encourages cardholders to pay their balances in full each month. 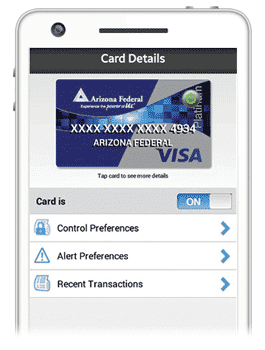 Arizona Federal Credit Union decided to make its lone unsecured Visa credit card offering something that provides the best of both worlds. The Visa Platinum boasts interest rates as low as 9.49% and a point-per-dollar rewards structure via ScoreCard Rewards. Arizona FCU also offers its unique Plus program that returns year-end profits to members who conduct at least 10 transactions on their account each month. Since 2012, the institution has returned more than $30 million to its members through the program. Consumers like options. That’s one of the main reasons there’s a coffee shop on every corner in America — right next to a pharmacy, convenience store, and grocery store. Options are equally important when it comes to financial services. What’s important to one consumer may not matter to another. But instead of building more banks and credit unions, it’s often up to existing institutions to offer a variety of services that serve the needs of every customer instead of focusing on specific demographics and products. While big national banks may dominate the airwaves with commercials and other advertisements, it’s often local credit unions that work closer to the communities they serve and give back the most to worthy local causes. That’s often because credit unions are member-owned and don’t have stockholders to answer to. Instead, each of these nonprofit institutions answers to its members — meaning that they’re more tuned-in to their needs and wants. Since 1936, Arizona Federal Credit Union has served residents of Maricopa and Pinal counties as well as the city of Tucson. Over that time, the institution has ingrained itself in those communities and earned high praise from those they serve. Whether it’s AFCU’s Plus program, which returns year-end profits to active members, or a pair of Visa-issued credit cards that provide rewards and low-rate opportunities, the credit union’s products meet the diverse needs of its more than 125,000 members. Over the last five years, the institution has invested heavily in technology, which resulted in two mobile applications that give members access to account tools from anywhere in the world. CardPower is essentially a remote control for your credit or debit card. The app lets members set transaction limits (which also can limit the card to working only in certain areas of the country), block international transactions, and set spending limits. Cardholders can also create spending categories on the app. For example, a category can make a card not available for online shopping. But even the greatest technology is useless if the credit cards associated with the apps don’t offer superior value. AFCU has that area covered, too. AFCU’s main credit card offering, the Platinum Visa with ScoreCard Rewards, features rates that range between 9.49% and 17.99% with no annual fees or charges for balance transfers or cash advances. Plus, cash advances are charged the same rate as purchases, unlike many issuers that charge a higher rate. The Platinum card boasts credit limits up to $25,000 and pays one point for every dollar of spend on the card. Those points are redeemable for merchandise and travel options through the ScoreCard Rewards program. For members who are either building or rebuilding their credit, AFCU offers a Visa Secured card with limits equal to 105% of the cardholder’s initial security deposit, up to $5,000 with a pledge of $5,250. The secured comes with an 11.24% variable APR and requires a one-time $25 set-up fee. The card’s security deposit is completely refundable as long as the cardholder’s account closes in good standing with no debts owed. What sets Arizona FCU apart from its competition is its unique Plus program, which started in 2012 and rewards members for their loyalty. Members qualify for the program if they perform 10 or more transactions on their account each month. In 2017, AFCU paid back 7.5% of interest paid. The amount repaid varies each year based on the credit union’s performance for the year. Whether you’re looking for low credit card interest rates or rewards for your loyalty, Arizona FCU’s Visa credit offerings and Plus program makes membership profitable for people at any stage of their financial journey. The institution invests heavily in its surrounding communities by offering workshops, personal financial coaching sessions, and its exclusive Financially Empowered Magazine.